This review is unusual because the three phones are powered by one and the same platform and the difference between each of them is slightly noticeable. 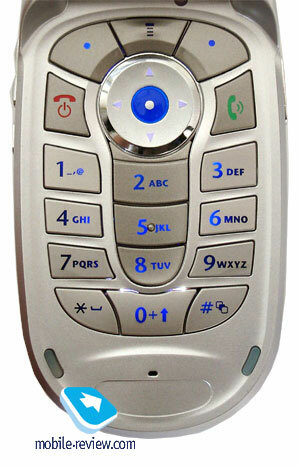 The older models feature Bluetooth support and some other functions. But if we take this in percentage, I’d say that they are identical on 85-90% percent. That’s we have decided to place these reviews together. 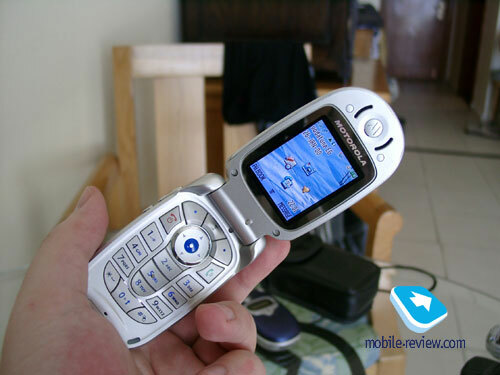 Motorola V500 was used as the main model, because it was the only phone that had final firmware installed. Another important factor is the change of the display supplier; from now on it’s Sharp. The new displays are brighter and more saturated; the picture display quality has been improved as well, comparing with the prototypes of the v-series and the first examples of serial models (Motorola v300, v500, v525, v600). It’s impossible to underestimate this fact since the display is one of the most important features of a modern day phone. 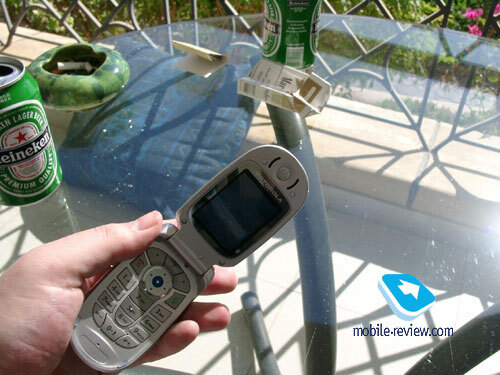 Before we move on to the review itself, we’d like to point out another difference, each model ahs its own set of preinstalled pictures and ring tones. They are identical for about 70%, however the rest is completely different. Alright, we’re now ready to start our V500 review. This phone is rather big and massive; you can call it plump for sure. On second thought, the phone does not seem too big; it’s proportional. 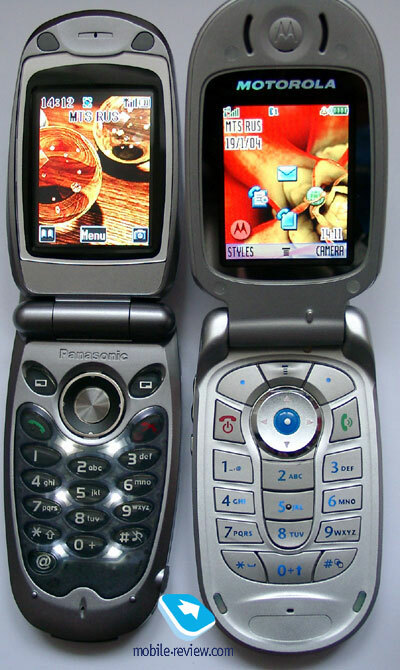 If we compare this model with its main competitors, we will see that this phone stands in the golden middle between Panasonic X70 (it is smaller and more elegant) and Sony Ericsson Z600 (this one looks less elegant without looking at the fact that there is no external antenna). The design and its choice is way too subjective parameter to discuss, let’s just say that any of the earlier mentioned phone’s size is okay, and no problems were caused. The phones are pretty similar. 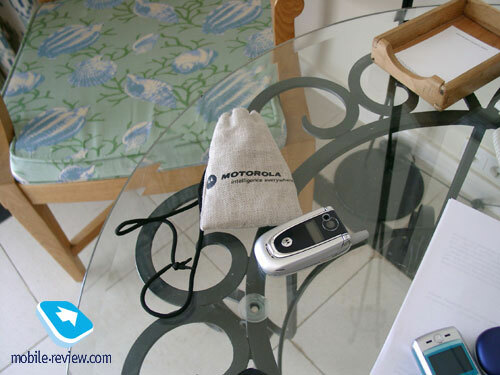 Now if we talk about the weight, then Motorola is certainly losing this game. 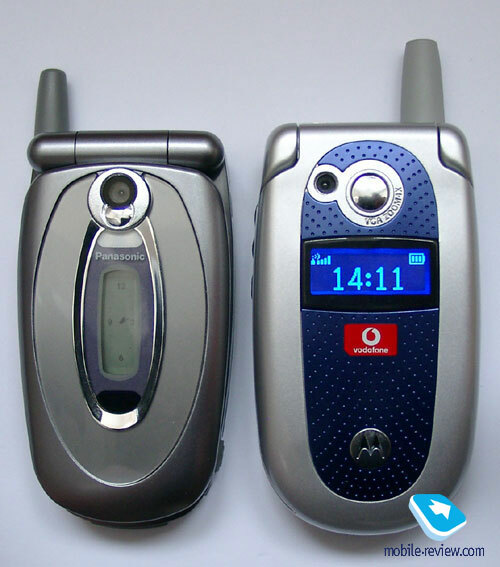 The Motorola v600’s weight is big since it has metal parts (120 grams with standard battery) and exchangeable covers in it, then what about the elder models? The V500 and V300’s weight is just way too big for their segments. This lack will firmly decrease the potential consumer number and targets this phone for men, and a small amount of women willing to buy it. All V-Series phones have significant mass, but it’s impossible to say that their usage is uncomfortable even after some time (87x47x23 mm, 95 grams). 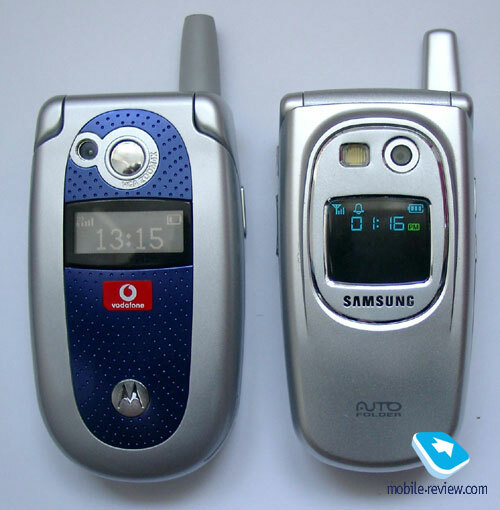 The size/weight ratio creates psychological confidence that these phones are durable. There is a certain category of people who definitely like this feeling. You can see the external display whenever the phone is closed. It can display the service icons and current time. Whenever there is an action going on the text line will be replaced with the appropriate text message. The screen is inversed, i.e. that white font is shown on the black background. The backlight is blue and very bright. Small mirror and the lens are located above the screen. In case with v500 you can see the color setting in on the front panel (but it’s not changeable), the case color gets different according to this setting in. The rest of the case is silver. You will see the holes made for speaker on the upper part of the closed phone. They were made in order the ring tone to sound louder. And since the speaker is located on the back side everything summed up together gives a really impressive volume level. 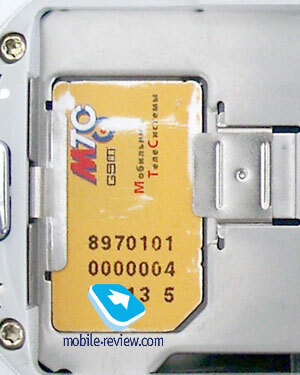 Handsfree connector is located on the top, as well as the hole for the strap. Interface connector is located on the bottom, you can connect the Data Cable in case Bluetooth is not enough for you. The joined volume regulator is located on the left side, and the smart-key is located slightly lower. The smart key allows switching profiles during the stand by mode. Another soft-key is located on the right side, it’s made for accessing the phone’s voice features and recording entries for the Dictaphone during the talk (just hold it). When you open the phone, you will see the internal screen. Like we mentioned earlier, Motorola decided to change the display supplier, and from now on these models have one of the best displays in its segment and in others as well. The screen has 176x220 pixel resolution and is capable of showing up to 8 text lines combined with three lines for the service needs. Font’s size is average and nicely readable. 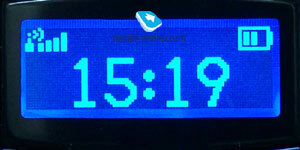 The TFT display can show up to 65000 colors. Checking out the screen’s behavior when it encounters direct sunlight was in my “To-Do list”. The information is still readable, and no problems with winter’s sun were encountered. However the picture sometimes turned pale, but it’s natural. I’d even dare to say that during summer and spring the information will be shown exactly like on the competitor’s screens. We couldn’t really resist testing this phone’s display with its competitors. 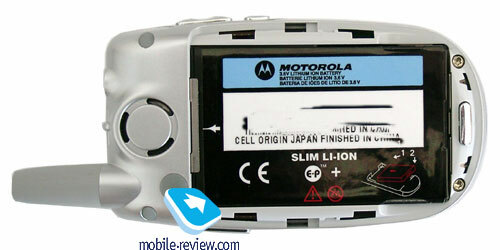 V500’s display was compared with Samsung E700, P510, E600, Panasonic X70, Sony Ericsson Z600, Nokia 7200. 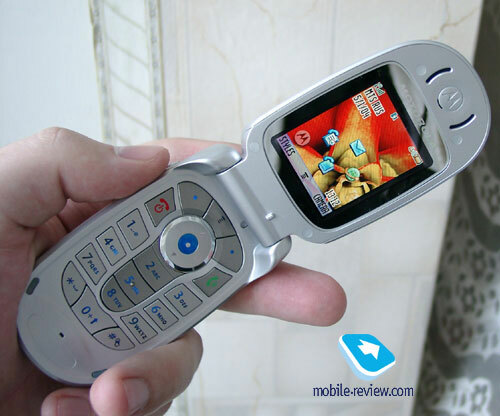 It actually came to me as a surprise that v500’s display quality was amazingly nice and definitely better than the one used in Sony Ericsson Z600, Nokia 7200. v500’s screen is slightly better than in Samsung phones (better sharpness, smoother color blends and there’s no moire at all). Comparison with the Panasonic X70 couldn’t define the winner though. Both screens are good at some aspects. For example, the picture looks more juicy and saturated together with smooth color blends in v500’s display, meanwhile it is more contrast, sharp and the color blends are not so smooth in the X70’s. The pictures looks amazingly nice in both cases, it’s just that manufacturers decided to use different ways to achieve it. The first thing that comes up on my mind is comparing mobile phone’s displays with TVs. Asians are trying to use more vivid and juicy default color schemes for their TVs, meanwhile Europeans prefer natural colors. But both TVs can be customized the way you like to see them, as for phones – this feature is not yet available. But it will be there some day. The key to this problem is not hidden in the lack of contrast and brightness settings, they’re present in both models. Saying that these interfaces were made for certain displays and the developer’s views will most likely be a more correct thing to do. That’s why all icons were drawn starting from these points, and it’s impossible to say which set of icons is better, and which is worse. It’s all a matter of taste. 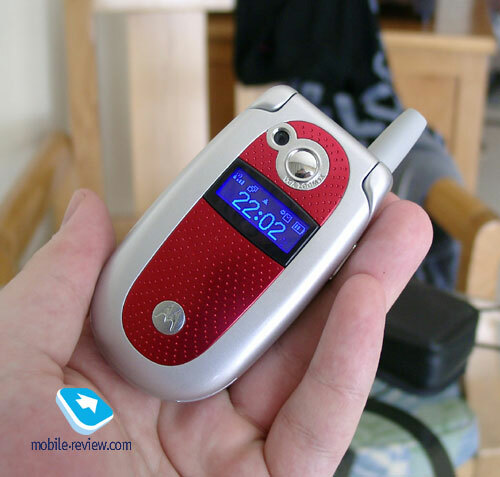 However Motorola v500’s display somehow reminds the one used in Samsung D410. 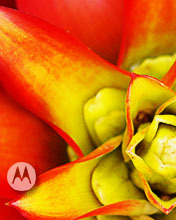 The color blends are smooth as well, and the picture transfer quality is awesome. 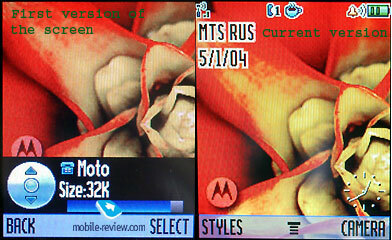 But when we directly compared these displays, Samsung D410 definitely came out as a winner. It’s another level after all (262k colors vs 65k). Let’s make it clear; at the moment v500’s and v600’s displays (in the new consignments) are one of the best on the market. You can see rubber settings in the lower part of the phone, they’re protecting the screen when it’s closed and are sticking out from the case rather significantly. They don’t bring any discomfort though. The keyboard is made of plastic; the buttons are big and placed well. The keyboard’s backlight color is blue, it’s clearly seen during the complete darkness and indoors, however when the sun is bright the symbols may be reflected. The OK button is built inside the navigational key, instead of Menu. This makes the navigation more comfortable and easier. You don’t have to be distracted from the soft-keys or move your finger. The keyboard is nice on the whole, mostly because of the phone’s overall size. There are some things left to tell, and one of them is the battery. This model cam use either thin or standard Li-Ion battery with 550 or 700 mAh capacities correspondingly. 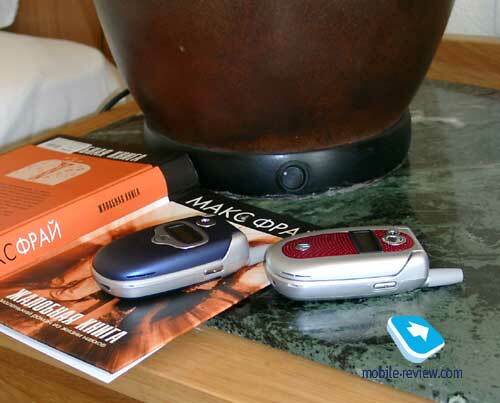 In case with the first battery – the phone will work for about two days (during testing), however if you use the second one it will work for the whole three days which is nice as well. Motorola claims that its phone can work up to 170 hours in the stand by mode and up to 3 hours during the talks (using the standard battery). 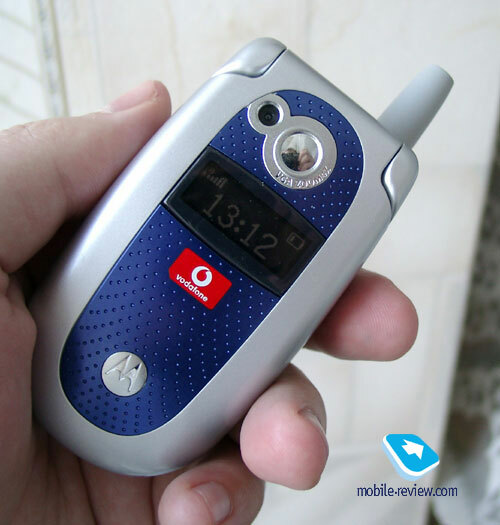 We were testing this phone in Moscow, and it worked for 3 days with 40 minutes spent for talks and 30 minutes spent for other functions (mostly games) daily. We were able to measure for how long the phone can work with turned on backlight during the stand by mode thanks to the preinstalled game Monopoly. It worked for 6-6.5 hours. A nice performance for a phone with such display. It takes one hour and 45 minutes for the phone to charge up.